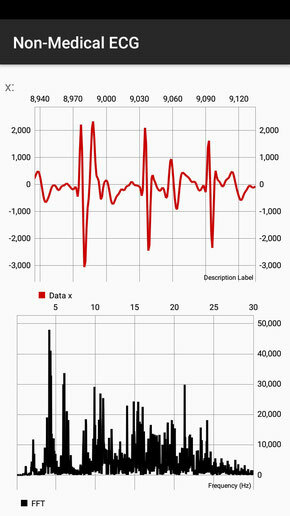 This FFT graph of non-medical ecg data has many peaks. This is due to a high variation in the heart's beat to beat intervals (HRV). As an individual gets closer to their Lactic Threshold, HRV drops and the peaks begin to converge on eachother. See the screen shot below for an example of LT FFT. This FFT graph of non-medical ecg has fewer, more distinguished peaks. Comparing this FFT to the previous screenshot above, one can see that the peaks have converged into one another. This is a result of HRV drop, which happens as an individual gets closer to LT. The peak at the far left is the heart rate frequency. LT is interpreted by monitoring and measuring this frequency and its behavior. 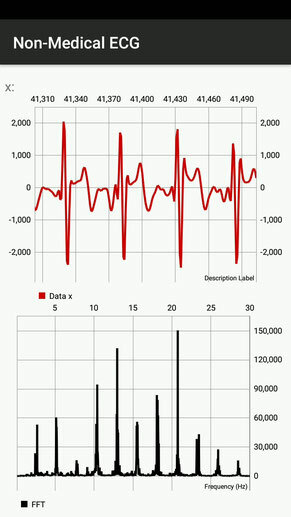 The other peaks are harmonics of heart rate, cadence, breathing, and artifact. Using FFT, artifact is rejected and only clean signal is left behind. Warm Down for 4 minutes.